UNITED NATIONS, Jul 12 2018 (IPS) - On a bright, sunny day in January this year, Liberian president Ellen Johnson Sirleaf turned over power to George Weah, a decorated soccer star, following peaceful and successful elections. This marked Liberia’s first democratic transfer of power in more than 70 years. Weah was referring to the Liberian civil war from 1989 to 2003, which left the country in tatters politically and economically. The United Nations Mission in Liberia (UNMIL) was deployed in 2003 to help restore peace and security in the country. After the peaceful handover of power, Kpadeh is correct when he says that Liberia’s key challenge is now mostly economic. “Limited employment continues to undermine the welfare of Liberians in both urban and rural areas,” notes the World Bank. The UN family will remain in the country “with a view to ensuring that the hard-won peace can be sustained and the country and its people will continue to progress and thrive,” Guterres added, in his statement. A “strengthened Resident Coordinator” will lead the team and help the government achieve targets set in the 2030 Agenda for Sustainable Development, Amina Mohammed, the UN’s deputy-secretary-general, said in March. 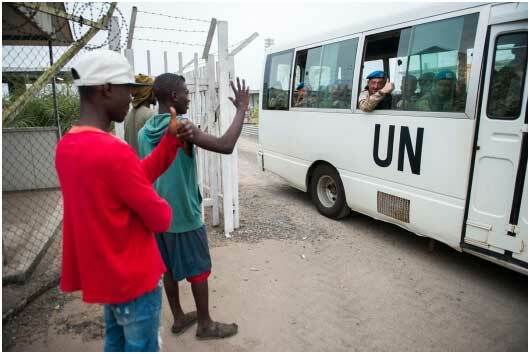 UNMIL began operations in October 2003, when about 3,500 troops of the Economic Community of West African States Monitoring Group (ECOMOG), who had arrived in Liberia a few months prior, were rehatted as UN peacekeepers. Guterres said that ECOMOG troops laid the foundation ahead of UN peacekeepers’ deployment. Coker recalls that “dealing with the ex-combatants, who had been in the bushes for more than a decade, was no easy task.” At the slightest provocation, such as a delay in payment of disarmament allowance, they rioted and threatened to torpedo the peace process. During such moments, UNMIL and partners often relied on Liberian women to bring the former fighters under control. Fourteen years of war, bad leadership and the Ebola epidemic might have derailed Liberia’s socioeconomic development, but Weah’s inauguration—as much as Sirleaf’s 12 years in power—appears to be rekindling hope in the country’s future. In sum: “Liberia is an important example of what sustainable peace means in practise,” reflected Mohammed, speaking for the UN.